Another perk is the my dad is an incredible painter and artist and the local grocery store (Wolfs Market) commissioned him to do a beautiful piece in their store. In return he has a HEFTY tab there! So for all those cooks out there, dinners are great to make- but paying for all those spices and meats adds up! Well, heading to parents house- they are FREE! So they enjoy delicious meals and I enjoy not paying for groceries! This dish I made the last night and it was by far one of the best I have made in a while. I was just looking through the Zite Ap on my Ipad and this one jumped out at me. I don’t remember who posted it or I would have given props, but its really good. Heat a large skillet with the olive oil and place your chicken’s in for about 5 minutes on each side. They should be nice and cooked on both sides. After they are done, I transferred them to a baking dish and put in the oven at 400 while I made the swiss chard. One, to keep the chicken warm and two, to make sure the center of the chicken is completely cooked. Depending on the size of the chickens you may need to leave in for about 15 minutes. Add the cut Swiss Chard into the pan you cooked your chicken in and let that start to soften. Once the chard is soft you will add the tomato paste and 2 tsp of the spice mixture. Let the chard cook with the tomato paste and spices for about 5 minutes until they are combined well. Add the coconut milk and mix until a nice creamy texture. To serve, take the chicken out of the oven. 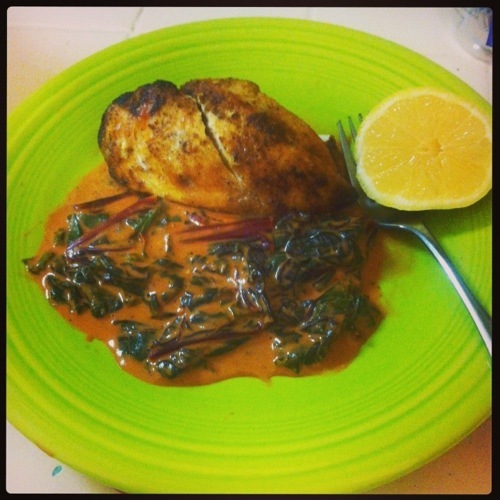 Add a scoop of the coconut cream chard to your plate and top with a chicken breast. Squeeze lemon over your chicken and serve. Enjoy!! 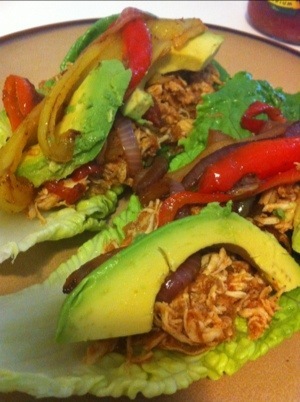 Paleo Chicken Fajitas in the crockpot! These I made during my lunch hour. 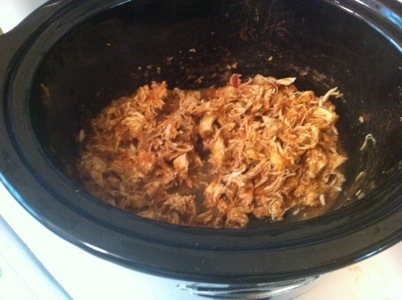 Threw the chicken, spices, and salsa in the crockpot, shredded a little later, then just quickly sauteed the peppers. Boom, done! Toss the salsa’s into the crockpot, then put the chicken on top. Add the spices and cook on medium. A few hours into cooking this, take 2 forks and shred the chicken. Put lid on and keep cooking. I started it around noon and took it out around 5. 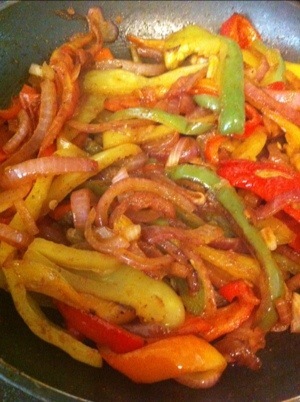 Take your peppers, onion, and tomato and slice them and sautée in a little olive oil. I added a bit of the spices to livin up the peppers. When they are all soft and carmelized together they are ready! 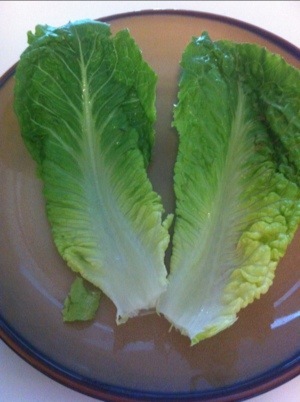 Take the lettuce leaves and use them like taco shells. 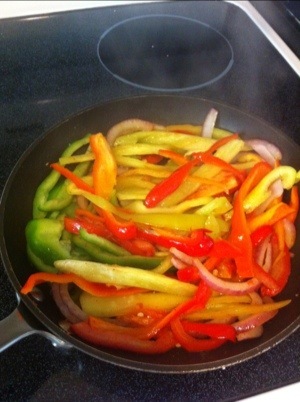 Add the chicken mixture, peppers, and top with avocado. A squeeze of lime and cilantro would have been great too. Make sure you have napkins because this gets a tad messy! Well first off, I can’t believe I am sharing this recipe. This has been the go to recipe for impressing guests. As long as they like their food a bit spicy. I always play with the spices and add more of this, a pinch of that, but if you follow this recipe you will get amazing results. There are two ways to make this. Paleo and Sooo close to paleo. The difference is really only when marinating the chicken. If you chose to marinate the chicken then you will use some yogurt. If you just saute the chicken, then you will avoid the dairy. But its so little, so it’s definitely up to you! 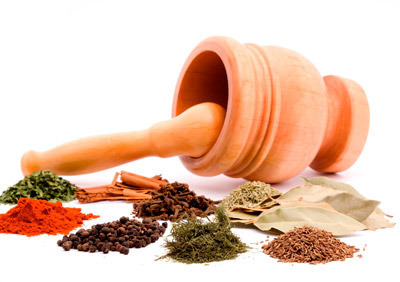 Spices, spices, oh how we love spices! Combine all ingredients in a bowl, refrigerate 1-2 hours. Longer the better. Put on skewers and bbq or just bake in the oven for 10-15 minutes, until chicken is done. Set aside. Melt butter and saute garlic, onion, and jalapeno in butter until onion is translucent. Season with cumin, paprika, garam masala. Stir in tomato sauce until all spices are combined. Slowly add the coconut milk until sauce thickens. You may or may not use all the milk, depending on how thick the milk is you use. Taste and see how you like at this point, you may want to add more spice or a dash of salt. Add cooked chicken and simmer all together for about 10 minutes. 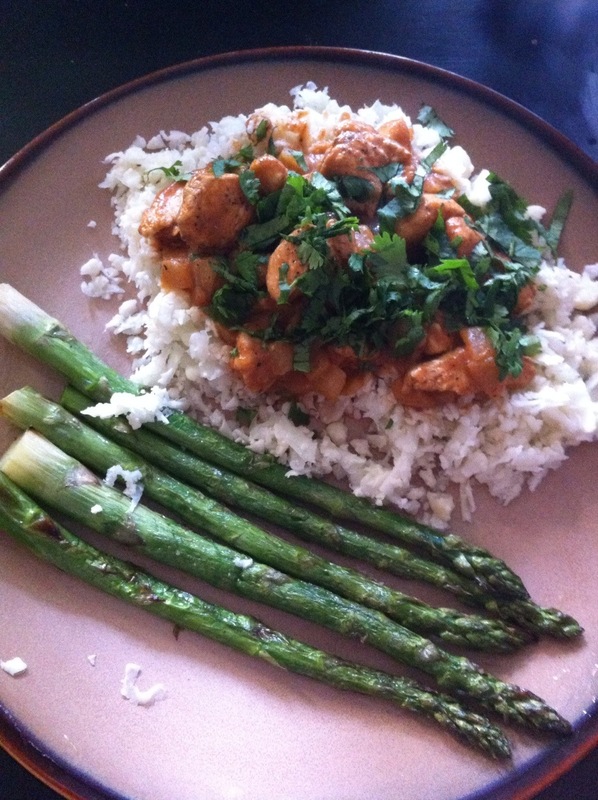 Serve over Cauliflower rice and top with cilantro. Put cauliflower in food processor until consistency of rice. Combine cauliflower and coconut milk in a pot. Turn on medium and stir occasionally. It is done when the coconut milk has almost completely boiled off. Serve under chicken! This picture is with the NON marinated Chicken. Also when you marinate the chicken first, it does add another layer of spice!